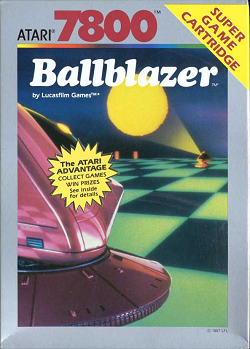 In this review, we find out if we can have a ball in the Atari 7800 game Ballblazer. We find out how well this sports game plays. This game was released in 1987. We previously played the Atari 5200 version and figured that there was no harm in trying the port to this console. These two games are very similar in nature, so this review will simply cover the differences between the two versions. The only difference seems to revolve around the somewhat improved graphics. While it is still a pretty impressive feet, it no longer has that edge of being one of the only first person perspective games anymore at this point. The graphics are still great for the time though. The music is somewhat improved. While the music isn’t that bad, there isn’t much in the way of variety. In-game, it is still just percussion sounds depending on the situation. The intro music is probably the strongest point, though other games by this point have small libraries of music by now. Overall, this game still stands out for it’s great graphics, though it is still running into some competition from other games. It is a two player only game and it would have been nice to see some basic AI for a computer opponent. An interesting technological feet, but you still need a buddy to play with. Furthest point in game: N/A. ← Freezenet Podcast Episode 03 for January 2019 Now On Patreon!